Shop GearHut at GearHut.com for all your JanSport carrying bag needs. 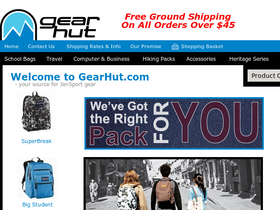 GearHut provides all kinds of JanSport bags from cute totes to camping backpacks. They have a huge selection of the hottest colors available and they never run out of stock. Products include: backpacks, duffels, luggage, hiking packs, computer bags, school bags and much more! Before you get a cool new bag from GearHut, be sure to stop by 58Coupons for GearHut discounts, GearHut promotions and GearHut coupon codes. Shop GearHut and get free shipping when you spend over $50 or more! Click link for this awesome offer. Check out the sale section at Gearhut.com and get select computer bags for 50% off! Click link to shop. Shop backpacks at GearHut.com and find select backpacks for up to 15% off! Click link and save. Shop GearHut and get 10% off select totes! Click link to see what's on sale. Buy as many items as you want up to $50 and receive $2.95 flat rate shipping fee from GearHut.com. Over $50 shipping is free.